Dust and Pet Allergies? You Better Clean Your HVAC System! I moved into my house 10 years ago and was wondering if getting all the dust and dirt out of the air ducts right out of the gate would be a good idea. I always had allergies to dust and animals, and the previous owners had a cat. After finding cat hair in the refrigerator, I figured there must be plenty in the air ducts! But the days turned into months…. and 10 years later I’ve been thinking that cleaning my HVAC system is surely well past-due. Then just as I was about to take action, I heard someone say that duct cleaning can actually loosen dust and make air quality worse. I wanted to do whatever was likely to keep my surrounding air clean while spending as little money possible. This article from House Logic had some helpful information that allowed me to be more comfortable with my decision to hold off again. However, after several lousy nights of interrupted sleep due to clogged sinuses, I had to do something! So I started by taking a quick look at the air vents and returns and the air filter even though it had been changed two month prior. I was appauled by what I saw! Filthy returns and a black air filter! No wonder dust was accumulating daily on every surface! So I immediately changed the air filter and got on a ladder with my vacuum. What a difference this made! 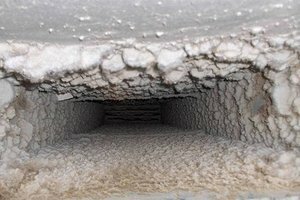 Without cleaning my air ducts, the surfaces actually stayed clean, the air was cleaner, the furnace surely was running much more efficiently and as you may have expected, I had a great night’s sleep! Feel free to comment or ask a question below. Categories: Fairfield County Housing Market, Health & Safety, Home, Real Estate | Tags: air conditioning, allergies, buyers, cats, duct cleaning, ducts, Fairfield County, fairfield county CT real estate, Fairfield housing market, health, heat, homes, HVAC, Linda Raymond, pets, safety, sellers, William Raveis, William Raveis Real Estate | Permalink. Good article Linda. Thanks. I can’t believe you’ve been in your house for 10 years. Time really does fly.